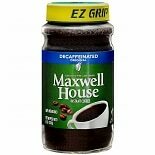 Shop Maxwell House Instant Coffee Decaffeinated Original (8 oz. )8 oz. $429$4 and 29 cents$1.43 / oz. 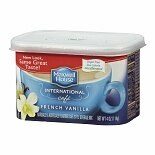 Shop Maxwell House Style Beverage Mix, Decaffeinated & Sugar Free French Vanilla Cafe (4 oz. )4 oz. 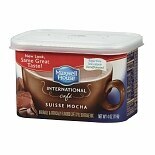 Shop Maxwell House Style Beverage Mix, Decaffeinated & Sugar Free Suisse Mocha (4 oz. )4 oz. 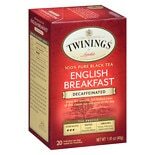 The perfect drink for coffee lovers who want to savor the taste of their favorite blend, decaffeinated coffee lets you enjoy coffee without the stimulant effects. These decaffeinated coffees don't compromise the flavor and body you expect, either. Whether you dislike the way caffeine affects you in the morning or just don't want to have a jolt in the evening before bed, a decaffeinated blend from Folgers or Seattle's Best coffee is a great way to enjoy the warm coffee you love. Just because decaffeinated coffees are caffeine free doesn't mean you aren't able to enjoy them any time you normally drink regular coffee. A hot cup of decaf warms you up just as well as regular coffee on a cold morning or snuggled under the blankets at night. 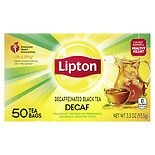 You also easily use these decaffeinated blends in any coffee beverages you enjoy. Adding flavored syrups or even a bit of Irish cream to your coffee results in the same delicious drink, just without the jolt.